Cancer of the oesophagus is a condition that tends to affect older people but can affect anyone. It is not very common in the UK but is a very serious illness that often needs quite radical treatment. The oesophagus is the tube that connects the mouth and throat with the stomach. When we swallow our mouth and throat work to force the food or drink down the gullet. Muscles then act to push the items into our stomach and try and stop any return back up the oesophagus. The actual cause of oesophageal cancer is not fully understood but research has shown that there may be links to long term anaemia which is a deficiency of iron in the blood. The most commonly experienced symptom of the condition is increasing difficulty in swallowing. If there is a tumour obstructing the oesophagus, any food travelling down to the stomach may find it difficult to pass. People may find they have to chew their food a lot more to make it smaller and some report that they can feel something in their gullet or chest. As swallowing becomes more difficult, food intake can drop and weight loss is common and this should be reported also. Indigestion is also common but as this can represent many things, it should not be automatically associated with cancer as this may cause unnecessary worry. Any difficultly in swallowing regardless of the suspected cause should be investigated so make an appointment to see your GP if you are suffering with this condition. Oesophageal cancer can be treated in three ways; surgery, radiotherapy and chemotherapy with many patients often needing a combination of these therapies. Chemotherapy involves exposing the individual to cytotoxic drugs, usually injected into a vein that aim to target cancer cells. Although chemotherapy is not likely to get rid of the tumour, it can help to stop it growing and may even shrink it; because of this, it is often used with surgery. Radiotherapy can be very useful although it may make symptoms worse at first. The radiotherapy beams are aimed at the cancerous tumour and can help to reduce it in size but is best used following surgery in case there are any cells remaining.Surgical removal in conjunction with the other types of therapy offers patients the best chance of survival though the surgery is major. 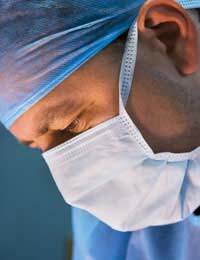 The actual surgical procedure usually involves removal of the oesophagus. It is sometimes possible to reconstruct the organ to some degree using the stomach and often a part of the intestines and specialised surgical techniques though this will never act as a natural oesophagus. Following surgery eating and drinking can normally be resumed to a healthy amount although the capacity of the stomach is likely to be reduced and portions will need to be smaller. Cancer of the oesophagus is a very serious illness and treatment is often quite extensive. The cause is not really known and the symptoms can develop quite slowly.